Students then had the opportunity to ask questions of a panel of experts about job and career options, ways into work and the expectations from business. Volunteers from Mars, Aston Bond, O2 Telefonica, Unilever, Leaseplan, Age Concern, GSK, Norsk Global, District Judge Tan Ikram were amongst the 80 panellists who kindly got involved and supported the Q & A sessions. After the Q & A sessions students made their way into the Market Place where they interacted with over 65 exhibitors to hear first hand about ways into work and what career paths their chosen GCSE's could potentially lead to. The event was open to the general public from 3.45pm to 7pm and during this time students, parents, and Slough residents attended the event to find out more about job and training opportunities. "Businesses that participated in this event had the opportunity to enthuse and motivate young people about their industry and potentially meet future employees, whilst universities and training organisations were able to promote their courses or apprenticeships and explain first-hand the entry level requirements. Slough Aspire Careers Event 2016 was very much about bringing careers advice alive for young people and inspiring them about their futures," says Rachael Burt, Managing Director of Learning to Work, the charity organising the annual event. She adds: "Slough has a vibrant business community. Many local employers fully supported this event. 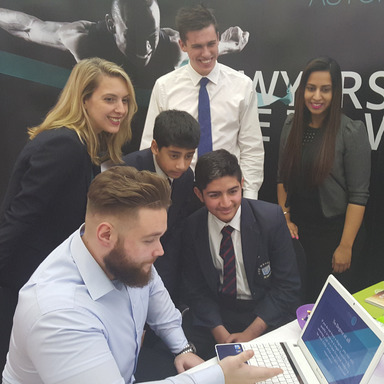 They were keen to be part of both the Slough Aspire Careers Event 2016 and nurture the future workforce. It is vital that young people understand the various career pathways open to them, the skills that employers are looking for and the type of jobs that are available locally. This was also a great opportunity for Slough residents to engage with the business community."